These eliminations continually shock me. Usually for singing competition shows, the elimination episodes follows a typical format where viewers can expect which contestant will be voted off. However, I've been consistently surprised at the cuts. The instant-elimination at the beginning of the results show is never whom I expect it to be. This week, two of the teens were sent packing and while I'm not shocked to see them go, the entire episode was surprising. Oh Arin, you never really found your place. This was his second time on the show but viewers apparently didn't like him enough to save him from the bottom pack. He tried to stand out and be something that he wasn't with the sappy love songs. Though, his obviously "edited" relationship and this week's strange song choice were the final nails in the coffin for his ouster. Another ballad for Diamond. I like Diamond but the problem is that she's performing very safe songs and not taking any risks. Once contestants reach the Top 10, they need to stand out to get up the ladder. She'll do fine but needs to change things up. Beatrice did not take her elimination well. First she lost her voice, then ended up in the bottom two before being voted off by the judges. It's sad to see a child cry and that's the point - she's a child. She can cry on stage if she wants. Carly finally reached first place. Her performance was amazing and I don't need to spend time talking about it. We'll see you at the finals Carly. Paige's performance was mixed. Sad songs and ballads don't have the same impact without the emotion behind them. Lucky for her that she rose in the rankings to survive the bottom. I don't think she would have survived the judges' vote if thins didn't go her way. Bottom two for Cece this round. Her momentum from last week didn't continue and she fell down the leaderboard. Though, the strangest thing is that the judges voted to keep her in. I expected them to vote her out based on their comments. I never know what to expect come Thursday night. Ugh... Vino... I don't know. He has talent, I'll give you that, but his song choices make me question how he'll be post-show. My expectations are low while fans obviously love him to keep him third once again. Tate slipped to second place this week. I'm starting to like Tate for the sheer fact that he is a genuinely nice guy. His performances are getting better and I'm pretty much guessing that he'll be in the finals as well. Fifth Harmony's song choice was a little questionable. They've taken the safe route like Diamond and it's starting to show in the rankings. 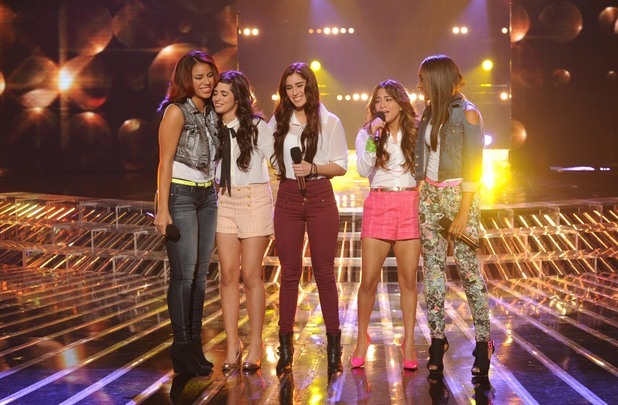 They need to step it up and win back the buzz they accumulated from the judges' house episode. Fans need a reason to vote and being just average isn't enough. Emblem3 is quickly rising up the ranks. Girls are voting in groups to help them out and I wouldn't be surprised to see them take third place next week. At this point the group is most likely a sure bet to survive and earn the "wildcard" third spot for the finals. What did you think of the Top 10? Post in the comments below and let me know about which performer you think will be sent packing next.